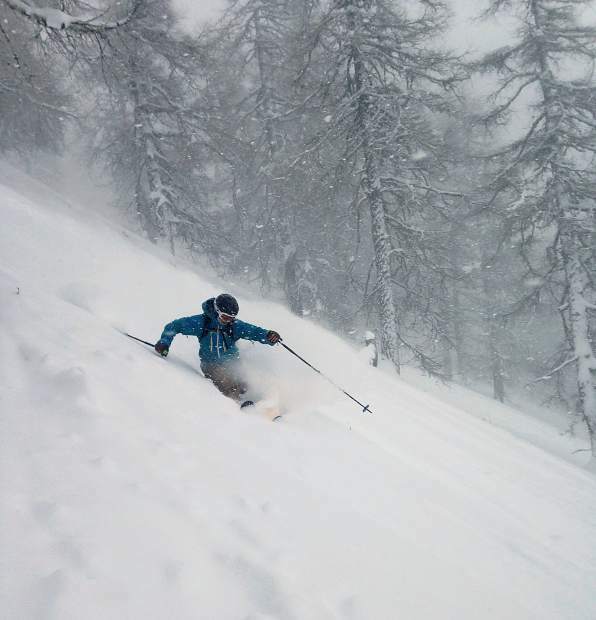 Matt Lanning skis Verbier, Switzerland this winter. Aspen may have had one of its driest Januaries ever this winter, and February wasn’t much better. But that didn’t stop ski fanatics such as Mikey Wechsler and Matt Lanning from hitting the mountain 120-plus days this season. As of Tuesday, Wechsler had skied every in-bounds day possible, recording his 123rd day on his season pass. Lanning claims about 110 days on his pass and a week of skiing in Verbier, Switzerland. Though he said it’s not his intention to put the fair-weather powder seekers down, Lanning regards himself as anything but powder-entitled. The same is true for Wechsler, a member of the Dogs ski club who said he has only missed around four days of skiing the past 10 seasons. “A lot of Aspen skiers are fair-weather skiers, or they only come out on powder days or whatever. There were days where people thought skiing was bad (this year). It wasn’t powder, it wasn’t great, but it was still good skiing,” Wechsler said of the January-February dry spell. Lanning said when people ask him how he keeps things interesting every day, he tells them the goal is always the same: “the path of most resistance.” If mountain-goers are going one way, he’s going the other. He’ll duck 15 feet into the trees, or he’ll pay close attention while riding the Silver Queen Gondola at Aspen Mountain. Lanning said he spends about 60 percent of his time on Aspen Mountain and the rest at Highlands. He’s also spent a lot of summer months skiing the southern tip of South America in Las Lenas and Ushuaia, Argentina. Wechsler spends about 95 percent of his days on Ajax and a handful of days at Highlands. Hiking the bowl is great, he said, but he wants to spend the majority of his time skiing. “(Hiking) is something special, but I’m a skier. I want to ski more. I don’t want to be spending my time hiking,” Wechsler said. Wechsler said he has about 140 days total this year. Every October, he buys a midweek pass at Loveland Ski Area. By June or July, both Wechsler and Lanning are up Independence Pass savoring what snow is left. “This year is a wildcard. Maybe there’s not much snow up there, or it could snow a few feet in April. Mother Nature is definitely the wildcard. She does what she wants,” Wechsler said. According to the Roaring Fork Conservancy, the current snowpack for the Roaring Fork watershed is at 81 percent of normal, as compared with the 1981 to 2010 median. January saw 5.26 inches of snowfall, the second-lowest amount for the month since 1935. “You’re popping through Traynor’s and dropping off something that’s 20 feet and thinking, ‘Uh oh, this could hurt.’ And you land in a perfect little pillow that wouldn’t have been OK 10 hours before that,” he said. “That was as good as Aspen Mountain ever skis,” Wechsler said.